When Mila discovers her sister will be the next victim on Sacrifice Day, her normal reply would be, sorry, I’m busy. After viewing ancient data and seeing the massive size of stoneshifters, Mila decides to rescue Tiana. Her sister is blood and she’d rather not see her tied to the sacrifice table and turned into jam. Like a giant cat with a teensy mouse, Zarblu plays with Mila. Catch…release…catch. Gentle and caring are words that no stone-beast monster should claim, surely? Desiring something that might kill you is insane yet the sacrifice table begins to look attractive. Zarblu is a big, strong, determined male who’s had a thousand, thousand years to contemplate life. This is not the normal level of dark that Cari Silverwood writes. This is the dark you reach for when you’re all darked out and one step from seeing your therapist. Some of this story is FUN. Dark dubcon fun, but fun nevertheless. Prey is the first book in the Dark Monster Fantasy. Cari Silverwood takes us to the world of Stoneshifters and every 10 years they must make love to a female to stay alive. Mila’s sister Tiana is to be sacrificed to Lord Zarblu and Mila must try to rescue Tiana. Mila is a mercenary-thief, star-rover, explorer of dead planets to find remnants worth selling. 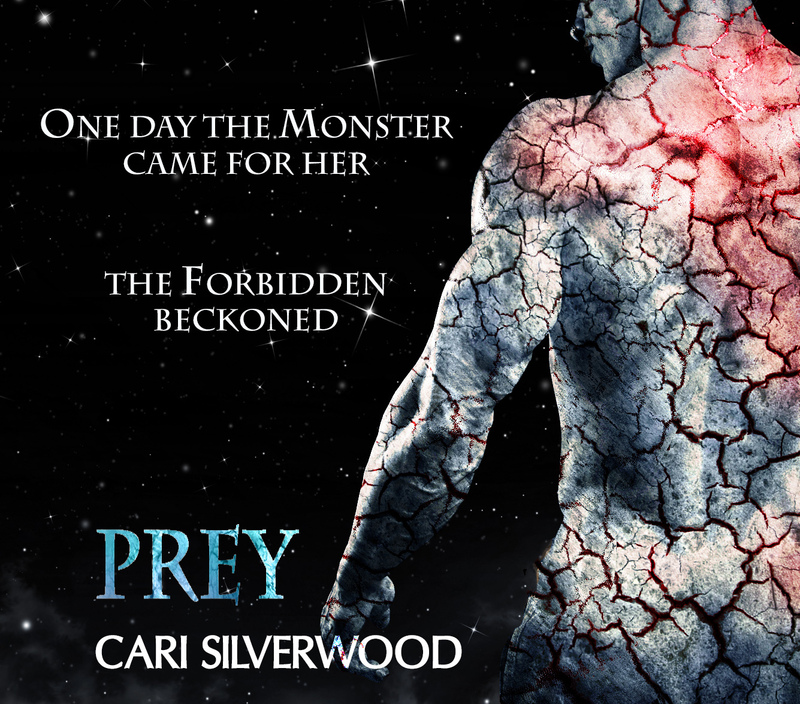 Prey is a novella so it is a quick book to read and I wouldn’t want to give anything away. I want to know what world does Cari Silverwood live in? She wows you with these little worlds of fantasy and make believe. These are usually dark worlds and not for the faint of heart. Hence the warning. Warning that Cari Silverwood has provided if you don’t like graphic books don’t read this one. I loved reading Prey and give it 4.5 stars. I can’t wait for the next book to come out!